What is the purpose of public education? Writing from his experience as a father, small business owner, and policymaker, Georgia’s Lieutenant Governor Casey Cagle presents a comprehensive vision to transform the way that public schools educate our students. Beginning with an idea which unites all Americans—that public education establishes the foundational promise of opportunity for all individuals by empowering us with the ability to learn, develop, and obtain anything we are willing to work for—Cagle makes the case for reforming our schools and rethinking the premise behind how we set and measure goals for student achievement. This is truly the challenge of a generation. Public schools are important—not just because of the millions of students who will spend thirteen years of their lives learning and preparing for the future in their classrooms—but also for the hundreds of thousands of teachers and educators who spend countless hours each week going above and beyond their duties to make sure all students are able to succeed. Most importantly, the central role of public education includes fostering the strength of our families, communities, and upholding the guiding principles of our nation. Seeking to remove the obstacles that impede student achievement, while eliminating any justification for complacency in our schools, Cagle explains a thoughtful vision for the future of public education, turning the status quo on its head in favor of leading individual systems, schools, teachers, students, and communities to educational excellence—today and for future generations. If there is one thing I know to be true, it is that everything rises and falls on leadership. 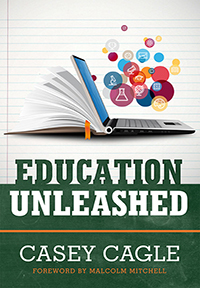 In EDUCATION UNLEASHED, my friend Lieutenant Governor Casey Cagle demonstrates and explains how effective leadership in the public school system can transform the state of Georgia. Join me in embracing these principles as we together seek to develop a new generation of leaders through education. Usher’s New Look recognized Lieutenant Governor Casey Cagle as our 2015 "Igniter of Education.” Presenting him with this honor was a way for me and UNL to express our sincere appreciation for the work he does daily. We look forward to continuing our work together as we challenge and empower our youth to become global influencers of tomorrow. In EDUCATION UNLEASHED, Lieutenant Governor Casey Cagle delivers his plans to dramatically reform and improve K-12 public education in Georgia. His ideas for putting children on a path to success—whether it is college or a career—are a blueprint, not just for Georgia, but for the nation at large. Developing a skilled twenty-first century workforce is essential for American companies to compete effectively in the global marketplace. In EDUCATION UNLEASHED, Lieutenant Governor Casey Cagle has outlined key initiatives that reflect his passion for reinvigorating K-12 public education so Georgia's students can fulfill their personal and professional potential.